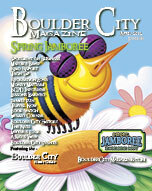 Chantal Magaruh and Rigby Ough have been residents of Boulder City for eleven years. They are very thankful for our oasis in the desert and its quaint atmosphere, as well as the wonderful people they have come to know here. They believe that it’s the perfect place to live and do business. As a husband and wife team of certified reflexologists, they have recently opened Clear Paths Reflexology. Reflexology provides a valuable drugless, non-invasive therapy to manage pain and stress. By using a specialized method involving the feet, hands and outer ears. Their treatments produce a profoundly deep sense of relaxation on the central nervous system supporting the body’s ability to reduce pain and stress naturally. Chantal and Rigby graduated from the American Academy of Reflexology in California and have been practicing for over three years. They each have more than two hundred hours of training specific to reflexology that includes condition specific techniques for those with chronic and degenerative diseases, cancer, pregnancy, PMS, menopause, depression, anxiety, and many other pain or stress related disorders. Chantal and Rigby are caring therapists, taking the time necessary to listen to their clients and answer any questions they may have. Sessions take place while lying down comfortably on a massage table in an atmosphere designed to be relaxing as well as safe. Footwear with socks are the only articles of clothing that are typically removed during a session. Chantal and Rigby are also affiliated with the Nevada Childhood Cancer Foundation and The Caring Place in Las Vegas, where they provide reflexology services to those individuals who have been touched by cancer. Their vision is to share the benefits and advantages of reflexology by promoting educational instruction to their clients through self-help techniques that allow them to achieve control over their own health and well-being. Clear Paths Reflexology is located inside Total Health Chiropractic at 1637 Boulder Hwy., Suite B. Call 702-374-9606 for an appointment.